The Devils continued their crucial western road swing today by defeating the Kings, 3-0 in Los Angeles. Keith Kinkaid stopped all 38 shots the Kings threw his way while the Devils got goals from Michael Grabner, Nico Hischier and Miles Wood in the victory. On St. Patrick’s Day, Kinkaid showed up to the rink in a flashy shamrock-laden suit and it must have paid off. He had the luck o’ the Irish and was phenomenal today in making his third straight start. The Kings sat at third in the Pacific Division at the start of play today, by no means guaranteed a playoff spot. So points are just as important to them as the Devils at this point of the season. The Devils are still dealing with some injury woes. Patrick Maroon missed today’s game and is listed as day-to-day with a lower body injury. Jimmy Hayes and Pavel Zacha are also injured while Mirco Mueller was the healthy scratch. With Maroon injured, Jesper Bratt slotted back in. With the injuries come roster moves through the lineup. Travis Zajac moved up to center the top line while Nico centered the second line. Coach John Hynes continued to tinker with the lineup, mixing and matching lines to try to get the most out of the pieces he has at his disposal. As mentioned, Kinkaid took the starter’s net for the Devils and got the 38 save shut out. This was his 100th NHL career appearance, his first shut out of the season and his fourth career shut out. It was his second against LA, the other coming on Valentine’s Day 2016. Kinkaid’s strong play raises a conumdrum for the Devils coaching staff. Do you start Kinkaid again tomorrow against the Anaheim Ducks and ride the hot hand, or do you rest him and give Cory Schneider a chance to pick up a win and boost his confidence? Back-to-backs are always a tough decision for coaches when a goalie gets hot like this. We will find out which way Hynes decides to go. LA started Jonathan Quick in goal and he made 25 saves on 28 shots on net. One of the early stories from the game were the penalties. Both teams were beating a path to the penalty box and were in trouble. But the penalty kill came up big for both sides. The Devils were 0-for-4 with six power play shots. LA was 0-for-6 with 11 power play shots. But while the power play was relatively ineffective, the PK was strong. The first goal of the game was a shorthanded goal, the Devils’ tenth of the season, courtesy of Michael Grabner, unassisted. The goal was set up when Kyle Palmieri took a high sticking penalty putting the Kings on the power play. On the ensuing PK, Grabner caught up to a loose puck in the neutral zone, skated into the Kings’ zone all alone and beat Quick over the glove to give the Devils the 1-0 lead. That goal was all Grabner’s speed, as he just blew by the Kings’ defense and created the breakaway. This goal was Grabner’s second as a Devil after finally getting his first the other night in Vegas. The Devils would make it 2-0 at 13:27 of the first when Hischier scored from Damon Severson and Brian Gibbons. After Severson took the puck from Gibbons in the Devils’ zone, he quickly hit Hischier with a stretch breakout pass that got Nico behind the LA defense as he caught them in a change. Hischier made a nice move one-on-one around Kings’ defenseman Drew Doughty and then fired a puck to the far post, beating Quick to double the Devils’ lead. Some penalty trouble for the Devils came when the Kings’ Tanner Pearson was stopped by Kinkaid – who made a nice save and the puck was cleared from the crease by Blake Coleman. In the process, John Moore took a hooking penalty on Pearson and the Devils went on the PK at 14:17 of the first. New Jersey would go down 5-on-3 when Ben Lovejoy took a hooking call against Tyler Toffoli 1:02 later. This gave the Kings 58 seconds of 5-on-3. To make matters worse, on this crucial PK, Andy Greene broke a skate blade, essentially making it a 5-on-2. But the Devils were able to clear, get Greene to the bench and kill off the 5-on-3 in what was a minor miracle. Wood would put a bow on the Devils’ win early in the third period at the 6:06 mark. Brian Boyle poked the puck away from a Kings puck carrier and that would spring Wood and Drew Stafford on a 2-on-1. Wood used Stafford as a decoy before firing the puck short side on Quick to make it 3-0 Devils. And that was all she wrote. Kinkaid made a few good saves late in the game to preserve the shut out and Taylor Hall was stopped on a breakway by Quick when he single-handedly stripped a Kings player of the puck, skated into the LA zone and went backhand on Quick before being stopped. Some scary moments as Nico was shaken up by a blocked shot late in the game (Hischier played another really good game) and Boyle took a Sami Vatanen clearing attempt to the forehead, drawing blood, once LA had pulled Quick with about two minutes remaining in the game. Stats-wise, time on ice was led by Sami Vatanen (22:00 including 2:59 on the power play and 4:19 on the PK), although of note, a whopping 7:01 of Greene’s 21:07 was on the penalty kill, a great feat in and of itself. Hischier led in shots on goal with five. Moore and Boyle both led in hits with three apiece. Moore had four blocks and Greene had two takeaways. The Devils won 44-percent of the game’s faceoffs. The three stars were: Kinkaid (first with the shutout), Green (second with his contribution on the PK) and Wood (with the goal – his 17th of the year – and an all-around good game). The Devils will be doing some scoreboard watching tonight. They have made some space between them and the Florida Panthers (who lost to Edmonton 4-2 earlier today) and leapfrogged Columbus (who are at home to Ottawa tonight) and Philly (who are at Carolina tonight). Should the Flyers win, they would take back third place in the Metro Division. Next up for the Devils, tomorrow night they play in Anaheim against a Ducks team that is on the bubble in the Western Conference. It should be a good one at 9 PM eastern time, as the Ducks are desperate and the Devils are trying to continue to roll. We will see you then. If you enjoyed this post, please feel free to follow us on Twitter @LGDevilsNet or email us at LetsGoDevils @ gmail.com. You can also leave a comment below the post. The Los Angeles Kings came into Prudential Center on an eight game winning streak while the Devils had just dropped two to Metro Division rivals in the Columbus Blue Jackets (a game where they had a 2-0 lead in the first period) and the New York Rangers. But the Devils knew that they were, as coach John Hynes had put it, playing “soft and loose” and they were willing to work to right the ship. The coaching staff held a practice on Monday that players were describing as the toughest since training camp and it paid off in dividends. The Devils beat LA 5-1 on Tuesday night, ending their brief slide and the Kings’ winning streak in the process. The Devils would need to right the ship without the services of Marcus Johansson, if at least for the night. Johansson is day-to-day with an ankle bruise suffered while blocking a shot against the Rangers. Ben Lovejoy and Dalton Prout were the healthy scratches. Drew Stafford came back in with Johansson’s injury. The Devils would also have a scare thrown into them late in this game against the Kings when Taylor Hall, who was working on a two goal game, suffered a knee-on-knee hit from Kurtis MacDermid. Hall would continue to play for a couple of shifts, but eventually left the game. Coach Hynes said that they will know more about Hall’s injury, if any, later today. The hit looked ugly, but hopefully the team does not lose him for any length of time. Hall would briefly tie Brian Gibbons for the team lead in goals with 11 until Gibbons scored a shorthanded goal late to notch his 12th of the year and take back the lead. The goaltending matchup saw Jonathan Quick going for the Pacific Division-leading Kings. He would make 21 saves on 26 Devils shots on goal. Cory Schneider was back in net for the Devils and made 16 saves on 17 LA shots. Cory also came up big when needed, including on a big save early in the first period on Dustin Brown, keeping New Jersey in the game when called upon. Travis Zajac got the goal scoring kicked off. He had been badly snake bitten since his return to the lineup, but connected at 13:44 of the first period. It came when Brian Gibbons pushed the puck through the neutral zone. He sent it along the near boards to Blake Coleman, who tried to pass to a cutting John Moore in the slot. Coleman grabbed the puck from him and started the cycle along the far boards, getting it Zajac. He turned and fired, with the rebound coming to Gibbons. He shot off of the paddle of Quick’s stick and the rebound dropped right back to Zajac, who tapped it by Quick to make it 1-0 Devils. The Devils would take a 2-0 lead into the first intermission when Hall scored his first of two. This one came on the power play, as Torrey Mitchell was serving two minutes for tripping Will Butcher and came at 16:14 of the first period. Butcher dropped the puck off in the neutral zone for Hall, who weaved with Pavel Zacha, giving him the puck and crossing up with him. Zacha gave to Brian Boyle just inside the Los Angeles blue line. He dropped to Butcher at the point and Butcher found Jesper Bratt along the near half wall. Bratt found a seam to Hall, who was swooping in on the back of the play. He had the entire half of the net to shoot at and did not miss, making it 2-0. Overall on the power play, the Devils were 1-for-2 with a single shot on goal – giving them a 100-percent shooting percentage on the man advantage. The Kings were 0-for-3 also with a lone shot on goal. New Jersey had a two goal lead going into the first break, but that was where they were against Columbus a few nights ago too. They would need to go for the kill to put a team like LA away. Hall would be up to that task. He scored unassisted at 15:42 of the second period to make it 3-0. It came when the Kings had some trouble in the Devils’ zone. Play eventually came to the LA blue line, where Jake Muzzin tried to corral the puck. Hall snuck in behind him and stole the puck, moving in one-on-one on Quick. Hall avoided the poke check and buried the puck five hole to triple the Devils’ lead. A little over a minute later, at 17:04, the Devils would add another one courtesy of Brian Boyle. It came when Boyle won the offensive zone draw for the Devils to Jimmy Hayes in the corner. Hayes kicked the puck to Stefan Noesen, who passed back to Boyle at the near faceoff dot. He fired one that beat Quick cleanly to make it 4-0. It was a nice goal set up by the Devils winning the faceoff. They won 57-percent on the night, so they did pretty good there for the game. The Devils took their 4-0 lead into an eventful third period. At the 12:04 mark, Torrey Mitchell would score from Alec Martinez and MacDermid to get the Kings on the board and cut off Cory Schneider’s shutout bid. But Brian Gibbons would get that one right back for New Jersey when he scored shorthanded and unassisted at the 19:49 mark. It was set up when Damon Severson went off for hooking at 17:53 and the Devils went on the penalty kill. As the Kings were trying to break into the Devils’ zone, Coleman put his stick down to knock the puck off Adrian Kempe’s stick. It bounced around to a few LA players until Gibbons cut off a pass and skated up ice with the puck. In all alone on Quick, he made a nice inside out move to beat him and make it 5-1 Devils. As mentioned, that was Gibbons’ team leading 12th goal of the season. It was also the Devils’ first shorty since their October 28 game against the Arizona Coyotes. And that was your final. Stat-wise, Steven Santini led all Devils skaters with 22:17 of ice time. Gibbons led in shots on goal with four while Sami Vatanen, Santini, Zajac and Jimmy Hayes all tied for the lead in hits with four apiece. John Moore, Andy Greene and Severson all had two blocks each to lead the Devils in that category. Next up, the Devils travel to Montreal on Thursday to face a struggling Canadiens team. The Devils will look to strike against a Habs team that has fallen out of things in the weak Atlantic Division. We will see how they respond in Quebec. Can they keep the momentum of the LA game going? Or will they fall back on bad habits? Also, will they have Taylor Hall available to them on Thursday. We will find out then. The Los Angeles Kings had gone into Brooklyn and lost to the Islanders, then followed that up by dropping a game that they controlled in Manhattan – with 38 shots – that the Rangers’ Henrik Lundqvist stole from them. They came into Newark a desperate group and it showed. They jumped all over the Devils early and never looked back, winning 3-1. The Devils came into tonight just three points behind the Flyers for the final wild card spot in the Eastern Conference playoffs. They could have picked up a big two points tonight. Unfortunately for them, they did not get any points and now find themselves even with the Isles, who defeated Columbus tonight in a very tight Eastern playoff race. The Kings came in on the bubble in the Western Conference playoff race. They boast leading scorer Jeff Carter. He is the only Kings scorer in double digits in goals (he actually doubles up Devils’ leading scorer PA Parenteau with 24 goals). The Devils lineup was largely the same as it has been. Beau Bennett is still out with an injury short term as of now while Seth Helgeson and Devante Smith-Pelly were the healthy scratches for the night. Los Angeles scratched Nic Dowd, Tom Gilbert and Matt Greene. One player who the Devils would be seeing tonight that they did not see when the teams clashed in LA in November is Anze Kopitar. The Kings’ captain would play a factor in tonight’s game even though his stats have been a bit down this year. They would not see Jonathan Quick in goal, since he has been injured since opening night. He might return for LA by March at the earliest. The goaltending matchup instead featured Peter Budaj for the Kings, who would make 24 saves on 25 Devils shots. The Devils started Cory Schneider, who was feeling better after his illness kept him out the last two games. He would make 9 saves on 12 shots faced. Much as the Devils forced a change in the Flyers’ goaltending in their last game, Cory was chased in favor of Keith Kinkaid in the second period. He pitched a shutout, as he made 13 saves on all 13 shots he faced. The Kings had a total of 25 shots, the same as the Devils and much less than they fired at the Rangers yesterday. The game got off to an auspicious start for the Devils. It began when Adam Henrique was hit in front of the LA bench by Drew Doughty. He fell awkwardly on his knee and would leave the game briefly, but return. Then, just 41 seconds into the contest, Kyle Quincey was called for holding against Jordan Nolan. The Kings were on the power play as soon as the game began and would convert. Kopitar scored at the 50 second mark from Carter and Doughty. The goal was his fifth of the season. It was 1-0 Kings. On the night, the Kings were 1-for-2 on the power play while New Jersey was 0-for-4. Then, less than a minute later, at the 1:46 mark, Tanner Pearson converted on a broken zone clear by the Devils and scored. He got assists from Carter and Devin Setoguchi. Just like that, it was 2-0 Los Angeles. The Devils were handed a fantastic opportunity when Trevor Lewis was called for boarding at 8:11 and then Kopitar went off for hooking at 8:27. They would have 1:44 of 5-on-3 power play time. But Budaj came up huge for the Kings and the Devils added a dinged crossbar and failed to score. Los Angeles would get out of the first period with another goal at the 16:15 mark when Alec Martinez scored from Marian Gaborik and Nick Shore to make the score 3-0. And that was about it, as Budaj and the Kings settled in. In the second period, there was some controversy as the Devils had seemingly scored when Nolan pushed the net off the moorings. The whistle blew before the puck crossed the line and referee Wes McCauley could have awarded a goal to the Devils if PA Parenteau was in the act of shooting when the net was pushed off (he was a split second behind). The Devils did get a power play out of it, as Nolan was called for delay of game, but nothing came of it for them. A scary moment came when Setoguchi was hit by a puck in the ear mid-second period. He went off injured. Late in the second, the Devils nearly gave up a fourth one when the puck came off of the end boards, hit Kinkaid’s skate, hit the post and sat in the blue paint of the crease. Michael Cammalleri was able to clear it, averting danger for New Jersey. The Devils broke up the shutout bid at 7:19 of the third period when Miles Wood went digging in the near corner for the puck. He won the battle and Cammalleri took it, giving it to Quincey at the near point. He fired a hard shot and the puck tipped in off of the skate of Martinez, making it 3-1. The Devils had finally gotten one by Budaj, but would it be enough for their third comeback from a three goal deficit this season? It would not, as Kinkaid was pulled at the 2:13 mark of the third, but the Devils could not maintain the zone. They had played a much better third period, but just could not finish the job. So, with that, Taylor Hall’s six game point scoring streak came to an end and the Devils failed to gain ground in the standings. To add insult to injury, the victory was Kings’ coach Darryl Sutter’s 618th of his career. The man he passed up the all-time NHL coach’s wins ladder? Jacques Lemaire. Next up the Devils faceoff with the Metropolitan Division-leading Washington Capitals at Prudential Center on Thursday in their last game before the All-Star break. They have to start stringing wins together or they will be in danger of falling out of the playoff race. The Caps are always tough to play, but we will find out what happens on Thursday. The Devils had come into Southern California winners of five straight and riding high. Now they are just happy to get out of Southern California. New Jersey lost 4-2 to the Los Angeles Kings and have now dropped two straight after their loss on Thursday against the Anaheim Ducks. Some roster news, Yohann Auvitu was sitting out his second straight game after being banged up in Dallas. Jacob Josefson was a healthy scratch with Blake Pietila making his season debut for the Devils. Pietila is the leading scorer of the Albany Devils and was called up to skate on a line with Reid Boucher and Devante Smith-Pelly. Coach John Hynes said that he “will add size and speed” to the lineup. Also in the lineup for the Devils was Beau Bennett, a native of Southern California and the first California born and trained NHL player to win a Stanley Cup (last year with Pittsburgh). He grew up a Kings fan, so this had to have been a special night for him. The Kings are a virtual MASH unit, missing key guys like Anze Kopitar, Marian Gaborik and Jonathan Quick. Pavel Zacha might have been the only Devil disappointed to not see Kopitar, as he models his game after him (a good two way player who scores goals) and was a fan of his growing up. He wanted to play against him, but will have to wait as Kopitar is out with an injury. But even with all of those injuries, the Devils still knew they would be in for a tough game. The Kings lead the NHL in hits, and are a very physical team capable of grounding an opponent down on any given night. As for goaltender Quick, he injured his groin in the first period of the Kings’ season opener and will be out of action until about January. Starting in his place tonight was Peter Budaj, who turned aside 21 of the Devils’ 23 shots. Cory Schneider was a bit of a surprise starter for New Jersey, as most figured Hynes would counter with Keith Kinkaid. Kinkaid did not get the nod as the Devils are not playing a back-to-back in California and have a more tightly packed schedule around Thanksgiving, where Kinkaid will get a start or two. Schneider made 24 saves on 27 shots faced. There was some concern as to how the ice would be today due to so many events packed so closely together at the Staples Center: there was a Los Angeles Lakers game last night, the Kings game today, a Los Angeles Clippers game tonight and the American Music Awards tomorrow. With such a busy building as the Staples Center is, there is always going to be some worry as to the quality of the ice, but it did not seem to be too much of a problem for the teams, although the puck was bouncing a lot throughout the game. The Kings were wearing their new black and grey Saturday alternate uniforms, which are being worn for their 50th anniversary season. Also, the initial puck drop was delayed about 15 minutes as the Kings were honoring Rogie Vachon, former Kings goalie, coach and executive and Hockey Hall of Fame class of 2016 inductee, in a special ceremony. The Devils broke the ice on this one just 3:38 into the first period when John Moore scored his third goal of the year. The goal happened when Moore fired a wrist shot through traffic to put the Devils up. Boucher and Smith-Pelly had the assists. With that goal, seven of the last 11 Devils goals have come off of the sticks of defensemen. The Devils had jumped out to the early 1-0 lead. It would remain that way through the first period due to strong play by Cory Schneider. The Devils were on the power play at about the 10 minute mark when Tyler Toffoli broke in short handed. He made a nice toe-drag move around Devils d-man Damon Severson and went one-on-one alone with Cory. Schneider stopped him to preserve the Devils’ lead. But the Devils could not keep Los Angeles off of the board forever. At 4:58 of the second period, Alec Martinez scored his third of the year from Nic Dowd and Devin Setoguchi. LA had sustained pressure in the Devils zone and the Devils were not able to get a change. With five tired New Jersey players on the ice, Martinez was able to find the back of the net. The Kings had tied things up at one. The Devils had chances to take the lead back. Adam Henrique was all alone in on Budaj late in the second period when Nick Lappin picked a Kings player’s pocket at the LA blue line. He passed it to Henrique, but the puck just rolled off the toe of his stick when he tried to shoot. With the Devils being badly outshot in the second period, a strong forecheck would later lead to the Kings taking a 2-1 lead when Tanner Pearson scored his seventh of the year unassisted. The Devils would get out of the second frame finding themselves down by a goal. But Los Angeles was not done. Just 45 seconds into the third period, the Kings found themselves on a 2-on-1. Cory Schneider made the initial save on Jeff Carter’s shot, but could not find the puck to cover up and Carter ended up tapping the puck behind him for his seventh of the season. Assists went to Toffoli and Drew Doughty. The replay showed the breakdown in the play by the Devils: Andy Greene pinched in in the Kings zone but had no forward covering which led to the 2-on-1. It was now 3-1 Los Angeles. A story of the night, as it has been for the last eight games is the Devils’ power play, or lack of it. The Devils went 0-for-2 tonight and have gone 0-for-26 over those last eight games. The Kings were 0-for-1 with the man advantage. The Devils would pull Schneider with 3:28 remaining in the third period, hoping to tie things up. They would come close. Nick Lappin scored at 17:28 off of a goal mouth scramble where Budaj did not have the puck fully covered and Lappin was able to bank it in off of a sharp angle. PA Parenteau and California-native Bennett had the assists. The Devils had cut the Kings’ lead to 3-2. But it would not last, as Jake Muzzin added an empty net goal at 19:32 when he was pretty much just trying to clear the zone and accurately fired the puck down the ice. Dwight King had the assist and Los Angeles had a 4-2 lead. And that was where it would end. New Jersey has now dropped two straight and will look to get back on track as they finish up their western road trip in San Jose on Monday. The Sharks are, of course, the defending Western Conference champions and we will see how the Devils bounce back to play them. The 2015-16 New Jersey Devils have been a hard team to get a handle on. They have not gone on too many extended winning streaks, winning three or four here and there. Up until about two weeks ago, they had not been on any extended losing streaks. Then, suddenly, the losses started to pile up and their playoff hopes seemed all but lost. Now, they are back in the thick of things, albeit hanging on by a thread, in the Eastern Conference playoff race thanks to two wins over two of the top teams in the West. The Devils came out of San Jose with a win but, although the Sharks are one of the top teams in the West, they are a notoriously bad team at home, so that could have been the Devils taking advantage of a team that has troubles at the SAP Center. Tonight, though, they would be facing the Los Angeles Kings. The Kings are in first place in the Pacific Division, a true Stanley Cup contender and just an all-around good team. Getting a win in LA would be a little bit different. The Devils would be without Jordin Tootoo, out with an upper body injury, as well as Damon Severson and Jacob Josefson. Jon Merrill was a game time decision and did not play. Getting the start in net for Los Angeles was Jonathan Quick. Due to the injury to Cory Schneider, fans were denied seeing the two Team USA goalies going one-on-one prior to the World Cup of Hockey in September. Quick made 22 saves on the night, facing 24 Devils shots. The Devils countered with Keith Kinkaid. Kinkaid had blanked the Kings the last time they met up last month at Prudential Center, earning his first career shutout. He made 22 saves while facing 23 Kings shots. On the MSG+ broadcast, Steve Cangialosi mentioned that after the Pittsburgh debacle a week ago, Kinkaid had a phone chat with Special Assignment Coach Jacques Caron, who, as longtime Devils goaltending coach, served as Martin Brodeur’s mentor. The results paid off, as Kinkaid has been stellar his last two games. The Devils wasted no time getting on the board: at 1:12 of the first period, the New Jersey forecheck forced the puck out to Devante Smith-Pelly in the slot who shoveled it towards net. The rebound came out to Tyler Kennedy who hammered it home. It was 1-0 Devils and Smith-Pelly had another point as a Devil, meaning he has scored in all but one of his games in a New Jersey uniform (the home game against Pittsburgh where the Devils were held to one goal). The Devils now had the lead and would nurse that for almost two periods. The ice was tilted towards the Devils in the first period. They had seven of the first eight scoring chances on the night (a lot of rebounds off initial shots) and Adam Henrique was stopped on a breakaway shorthanded in the middle of the first – one of several Devils shorthanded opportunities on the night. And that was a big story: the Devils’ penalty kill. New Jersey had one power play to the Kings’ five (including a Bobby Farnham double minor for high sticking that came at 3:03 of the second that the Devils successfully killed off) and were successful in eliminated all of them. But they were playing with fire, as LA is a team with a very skilled power play. Still, it did not hinder the Devils tonight. If the first period was tilted in the Devils’ favor, then the second was the complete opposite. Los Angeles had a lot of sustained pressure in the period and, in fact keeping the Devils pinned into their zone would directly lead to the Kings’ only goal. At 14:36 of the second, Anze Kopitar scored his 21st of the year from Milan Lucic and Alec Martinez. On the ice for the Devils were defensemen Seth Helgeson and David Warsofsky. They had been on the ice for a full 3:47 when the LA goal was scored. As the Kings had the Devils pinned in their zone, they could not get off for a change and were gassed by the end of their shift. Still, that was a remarkable sequence that earned Helgeson the hard hat as “game MVP” for the Devils. He only got it over Warsofsky because Kopitar’s stick clipped his mouth as Kopitar was following through on his shot, cutting Helgeson and drawing blood. And with that Kings goal, Keith Kinkaid’s 98:31 shutout streak had come to an end. The Devils had been giving him lots of support by blocking shots. Helgeson had his share of blocked shots in his 3:47 on the ice for that shift, but the Devils have been doing this more in the last two games. The game was now tied at one, but late in the second period the Devils would go on their only power play when Martinez was called for hooking. The call came at 19:16, so the bulk of the power play would come on fresh ice. 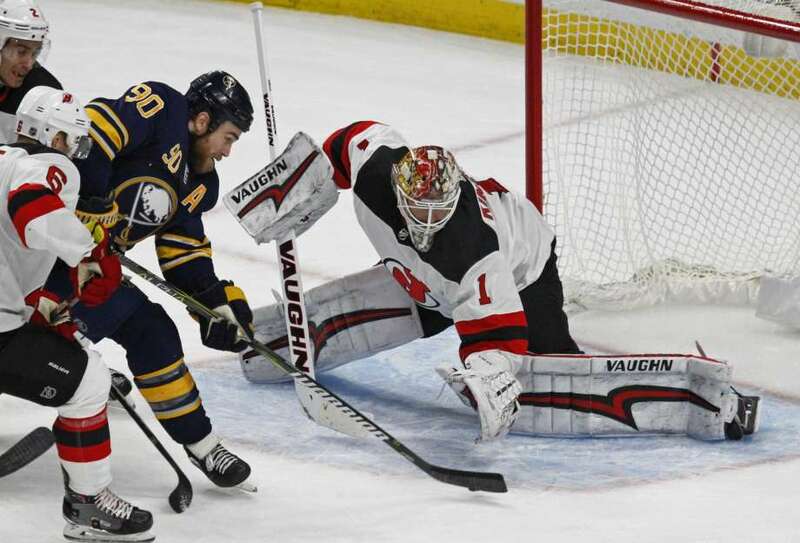 Although the Devils did not score with the extra man, Quick was forced to make a great save on John Moore and the Devils showed good puck movement, something that was very encouraging going forward. The third period was full of exciting end-to-end action, although somehow both teams went more than seven minutes mid-period without a shot. This was largely due, in the Devils end, to the sheer number of blocked shots that they had. The Devils ended up with 29 blocked shots in the game, to the Kings’ 11. Regulation would end and three-on-three overtime would begin. Both teams came in with fantastic overtime records: the Devils were 7-1 and the Kings 10-2. As usual it was back-and-forth action in OT, hinging on puck possession. Henrique was stopped on a full breakaway by Quick about halfway through and things seemed to be headed to a shootout when, at 4:44, John Moore struck. He took a pass from Joseph Blandisi at the Devils blueline and skated it up ice, trying a wraparound. He mentioned in a postgame interview that he saw Kyle Palmieri in the slot and was going to pass to him, but as he came around the goal cage, saw that Quick was cheating off the post a little. He fired at the gap between goaltender and pipe and found his mark. The Devils had the 2-1 overtime win and were 2-0 in California so far. The game winner by Moore was only the second goal by a Devils defenseman in 17 game (and the last one was an empty netter). But New Jersey had the win and are going into the Honda Center looking to sweep the western road swing with a win in Anaheim on Monday. Though the Devils’ playoff hopes are still a bit murky at the moment, there is still a faint glimmer of hope. Teams above them still have games-in-hand and they are still about six points behind Detroit for the last wild card spot. But there is hope at this point and that is really all a fan needs right now. The Devils had an almost insurmountable task ahead of them. Coming off of an afternoon OT victory against the Flyers, they would be right back at it less than twenty four hours later against the powerful Los Angeles Kings. It was ugly at times, but they succeeded in picking up four points on the weekend with a 1-0 win over those Kings and have (for the time being) moved into third place in the Metropolitan Division, leapfrogging the Islanders. There were no lineup changes to the Devils’ roster for the second half of the back-to-back aside from Keith Kinkaid getting the start over Cory Schneider. Eric Gelinas, Stefan Matteau and Tuomo Ruutu were the healthy scratches. Kinkaid will be getting a lot more ice time as the Devils have a few more back-to-backs coming up over the next month or so. Kinkaid would make 27 saves as he posted his very first NHL shutout in his tenth NHL win. Facing him across the rink was Jhonas Enroth, getting the start for LA due to Jonathan Quick’s injury suffered in Boston last week. He made 17 saves on 18 total Devils shots. Part of the reason for the Devils recent success has been their power play. They got another boost in that department in this game. The only goal of the game came after Los Angeles’ Vincent Lecavalier was called for hooking at 5:15 of the first period. With the Devils a man up, Travis Zajac won the faceoff in the Kings’ zone, banking it off the wall to David Schlemko. He shot on net and the puck beat Enroth. Although Schlemko got credit for the goal, replays seemed to show Joseph Blandisi tipping the puck in off the heel of his stick. MSG+ analyst Ken Daneyko noticed it first, but as of the end of the game, the scoring had not been changed, although it still can be changed. That was the only goal of the game as the Devils led 1-0. Late in the first, the Kings had a great scoring chance when Alec Martinez hit the crossbar. The Devils would go back on the power play a few moments later, when Los Angeles’ Drew Doughty was called for holding at 20:00 of the first. The Devils would have a full two minutes with the extra man at the start of the second period with a fresh sheet of ice. The Devils would have a wonderful scoring chance on that power play when Jacob Josefson hit the post. The teams were now trading posts and both goalies were coming through with good play. Because of that post, the Devils did not register their first shot of the second period until the 7:27 mark. The Devils would go on another power play at 17:52 of the second when LA’s Nick Shore was called for holding Adam Henrique. The Devils had another good power play showing, with Lee Stempniak getting a good chance at a wide open net. The puck was just tipped away by Martinez at the last second. The Devils had an injury scare when Tyler Kennedy took a shot to the knee at 8:44 of the third and limped off the ice. He did not return and there was no word on his status. The main theme the announce crew was mentioning was stick positioning of the Devils. They were cutting down passing lanes and gaps by keeping their sticks where they needed to be. It allowed the team to weather a Kings offensive onslaught late. Keith Kinkaid also came up big with a few timely saves while nursing a 1-0 lead, his shutout was much deserved. Kinkaid’s childhood idol was Martin Brodeur and he is now only 124 shutouts from tying Marty for the NHL record. Next up, the Devils welcome the Flyers back to The Rock. The Devils, including yesterday’s win, have gone 11-2-3 against Philadelphia since the start of the 2013 season. This also begins a run against Metro Division opponents over the next week that includes the Isles and the Capitals. The Devils will try to emulate what they did on Saturday and defeat the Flyers, hopefully kicking off a good week for them by getting some points in big Metro Division games.